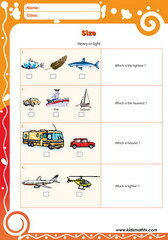 Size and capacity math worksheets for children of all ages to learn how to differentiate between objects based on some familiar expressions like: bigger, smaller, longer, shorter, can contain more or less, taller vs shorter etc. 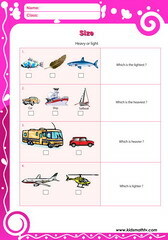 Each worksheet is highly illustrated and uses a number of pictures of objects to show how kids can start applying such concepts. Great extra teaching material for teachers and parents of kids at primary school. Practice Light or heavy worksheet with this worksheet. 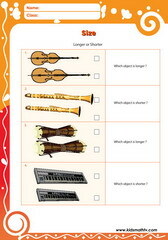 Practice Size long short worksheet with this worksheet. 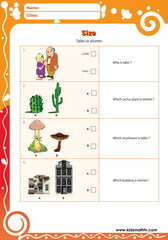 Practice Tall short worksheet with this worksheet.